Robert J. Sawyer. Rollback. Part I of IV. Last month’s issue of Analog featured the conclusion of a four part serialisation of an Edward M. Lerner novel set in his ‘Dangling Conversations’ milieu, several stories in which setting had previously appeared in Analog. These all featured humanity in radio conversation with a variety of alien species, in which long-distance transmission of intellectual property became the trading mode between races too far apart to ever communicate in real-time. Obviously editor Stanley Schmidt likes this theme, as this issue starts with another four parter with a similar theme – sort of chain-troping I suppose. Sawyer’s twist in this first installment is that with 35 years between replies, it’s going to be a staccato conversation. His ploy is to have the scientist who deciphered the first alien message and composed the reply, to have rejuve treatment (paid for by a billionaire businessman) so that she can be around to take part in the subsequent parts of the conversation. She’s bright and used her expertise in Scrabble to decipher the first message (Analog tends to rely on solo scientists cracking such problems, rather than computers or teams of experts), but the cliffhanger at the end of ep1 is that whilst her geriatric husband (who also has the treatment) starts to rejuve, previous medical treatment prevents her rejuve from working. 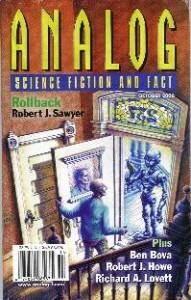 Given the length Sawyer has, he is able to build characters more three-dimensional than is the case, but it’s still SF of the ‘hard S easy F’ type – with a lot of detail on how the alien code is cracked. Kudos to Victoria Green for the cover art which tackles some tricky perspectives and lighting, and even went to the effort of having wallpapered walls rather than emulsion paint. Ben Bova. Takes Two To Tangle. Lightweight japery featuring Bova’s Sam Gunn, who evidently appeared in a number of stories in the 80s and 90s. If you were into those stories at the time you’ll probably welcome him back as an old friend. For me it’s a bit more of an Austin Powers scenario, with a slightly dated feel to the story, the characterisation and the plot. David Walton. Rivals of Mars. Near future setting in which a large proportion of women are infertile, leading to those who can carry babies to have the option of well-paid surrogacy. A couple in which the woman is a surrogate have their relationship tested by her taking on another client. Fast forward to a birth on a storm-tossed night in a remote wilderness, and there is a resolution to make a change to their lives. The story doesn’t really need SF for it to work, and it’s just a bit too short to maximise the potential the story offers to explore how the couple deal with the situation. Richard A. Lovett. Nigerian Scam. Lovett is an Analog regular, and in this issue has this story, a Science Fact article, a letter, and a short biolog of Robert J. Howe – way to go! The story is a neat one, in which the Nigerian email scams are given an alien twist, with an offer too good to be true coming from a source too distant to be true. But in fact the alien on the other end of the email is able to deliver the goods, leading to a lot of financial success for the man who responds to this opportunity. However, there is ultimately a catch, as it transpires that he has been set up to facilitate an alien invasion. Fortunately for humanity the invasion isn’t quite of the scale necessary (think HHGTTG). Robert J. Howe. From Wayfield, From Malagasy. Howe’s two stories in Analog during 2005 were of the ‘scientist fiction’ type – here he goes offworld, with the crew of a stranded spaceship having to come to an understanding with the indiginous population, descended from humans from a previous wave of human expansion. Fortunately there’s no xeno-linguistic nonsense, (although the means by which the aliens are able to pick up the current standard language quickly is just a little too easy!) This does enable the story to get to the heart of the matter, as the humans are lacking food and supplies, but subtle cultural norms in the local population make trade impossible, and stealing the locals’ cattle is seeminlgly the only option available to the stranded crew. When this goes fatally wrong, it appears that all is lost, until finally the aliens and humans are able to come to some sort of an understanding. However, this understanding is a rabbit pulled out of the hat at the last moment, and I’m not entirely sure what the resolution was! Victoria Green and Richard A. Lovett (the story) are the pick for me, with Bova and Howe providing more traditional Analog fayre, and Walton going out on a bit more of a limb albeit without a whole lot of success.